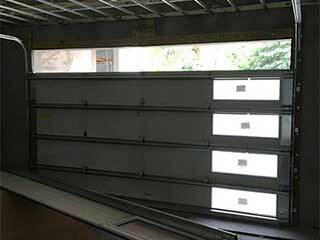 Sooner or later, the time will come for you to get a complete garage door replacement. Until then, though, you may need to have a couple of parts replaced to keep your current system up and running. The process of replacing doors and parts of the mechanism is not an easy one, and it requires special tools and great skills. You can be sure that our technicians meet all the requirements and then some. Aside from performing the new door installation for you, our experts can help you through every step of the process. We can help you take everything into consideration, and make sure that you don't neglect to factor in some crucial detail that can make your new door either a perfect match, or a nightmare if you forgot to consider it. The material your new door will be made of matters a great deal. Wooden doors are beautiful to look at, and they are natural insulators too, which can make them an excellent choice for many homes. However, they will require more frequent maintenance in order to be well preserved. Steel garage doors have the ability to provide your home with an increased sense of security, as they are very durable. Aluminum doors have the benefit of being very light in weight, which will make them require a far less powerful opener. They also need virtually no maintenance, which can be a great plus. Unfortunately, they tend to damage very easily. What your door will be made of is obviously the most important thing. However, there are other factors that you'll need to think about before making a choice. Weight is very important, as it will determine whether or not your current opener will be able to handle your new door. R-value is just as important, as it will let you know how insulating the door will be. A higher number can help you save money on energy spending, as an insulated garage door will make it easier for your HVAC system to maintain the air temperature you desire. Our comapny, Garage Door Repair Rocklin, provides products manufactured by the industry's best brands, such as Stanley, Clopay, and Craftsman. Their various collections are wonderful in both quality and functionality, and we can help you find the best one for your specific needs. Once you've made an informed decision, we'll remove your old door and install the new one in its place, making sure every component is well fastened and that the springs and tracks are all properly adjusted and aligned. Give us a call today.